Hypertension increases your risk for heart attack and stroke, but aerobic exercise can help steadily lower your blood pressure. 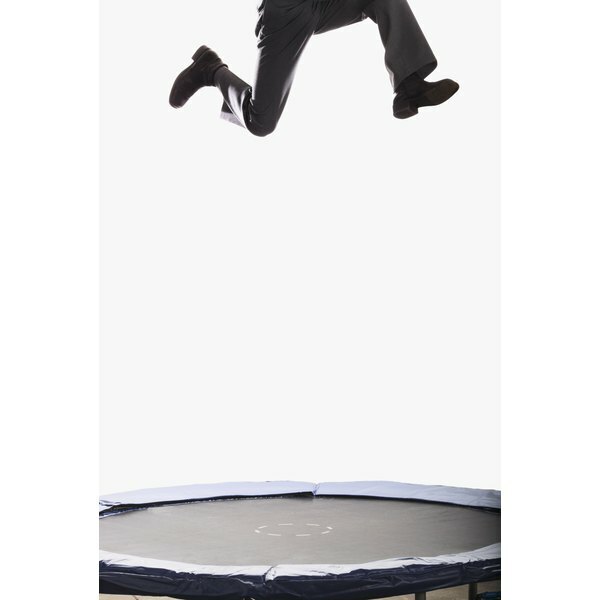 Rebounding on a mini-trampoline helps increase your heart rate, giving you a strong cardiovascular workout. However, the increase in heart rate can pose some health risks to people with hypertension, so talk to your doctor before beginning a rebounding program. Hypertension is a form of chronic high blood pressure. Blood pressure tends to increase with age, and genetic factors can make you more prone to hypertension. You're also more likely to develop high blood pressure if you smoke, are overweight, consume too much alcohol, eat high-sodium foods or lead a sedentary lifestyle. Although there's no surefire recipe for completely eliminating hypertension, addressing lifestyle factors is often the first line of defense for treating the disorder. According to a 2012 study published in the journal "Hypertension," aerobic exercise can help reduce hypertension -- even in patients who have hypertension that's proven resistant to medication. Rebounding elevates your heart rate, which helps exercise your cardiac muscles, improving their efficiency. It also increases circulation, which can help you avoid life-threatening disorders such as blood clots. Although rebounding can help you steadily lower your blood pressure, it's not without risks. If your blood pressure is higher than 180/100, your risk increases even more. This is because the elevation in your heart rate can tax your cardiac muscles. Moreover, high blood pressure is associated with other medical problems such as blood clots and poor circulation, and these conditions can make exercise riskier. According to Gavin C. Hillman and Len Kravitz of the University of New Mexico, 20 to 60 minutes of moderate cardio three to five times a week can help reduce hypertension. Listen to your body, and avoid pushing yourself. You might, for example, try jumping for just five minutes every day for a week, then gradually increase the time you spend jumping. Any exercise is better than no exercise at all, so don't be discouraged if it takes time to build up to the recommendation. Drink plenty of water during and after your routine, because dehydration can alter your heart rate and blood pressure.